Good on Natalie and everyone else that was there. 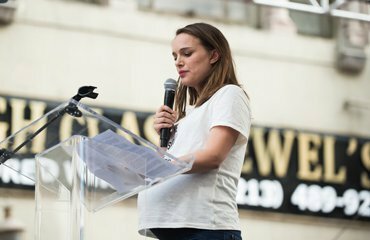 It’s about time it was made clear to Trump and his cronies that open racism, sexism and bigotry is NOT ok.
Also, that awesome speech she gave made think of this: Natalie for President 2020! Democracy is in danger, hope we have peace soon. Why do people bother with politics? There is so much more to life such as a morning cup of coffee, or even those overly powered energy drinks that leave your heart barely pumping and leave you half dead when they where off. The only time I’d get involved with politics is if there was an emergency in society and needed some political savior to come along with a nice totalitarian government to fix everything ;). But seriously a revolution? Is that orange skinned crinkle faced big overgrown baby worth all of the fuss ? Sure he is “Mr president” now but why care? Getting angry over trump would only satisfy his lust and need to cause chaos in society. I personally will give the guy a chance with high hopes. But whether he is good or not I shall remain out of this political mess. Best wishes! @Ol’ Cal: this expired orange potato is backed by a both mostly republican House of Representatives and Senate and he is in power to do some real damage over the following 4 years. – To start with, he can appoint judges that will stay in their positions for life. If he appoints egocentric, bigoted and conservative maniacs, there’s absolutely nothing a next term president can do about that unless said maniac dies. – He can unravel the medical health care system and undo the beginnings of Obama’s goal to make health care affordable for everyone in the US. – He can choose not to put effort in battling climate change and the strain on natural resources. – He can start another war that will cost the US population a lot of money and another country a lot of lives. – Lastly, those goals he mentioned about creating “american jobs” will be outsourced to countries that don’t bat an eye at child labour and don’t care about fair wages. Let’s be honest here, the U.S. is essentially already a glorified third world country. The gap between the rich and the poor is enormous and the middle class gets beaten down. I live in Europe and I get better job benefits, better health care than my friend who has a Master’s Degree. My education opportunities were also a lot cheaper. I for one, have zero student debt because I don’t need a mortgage to pay for my degree. I also don’t have to worry about ending up in jail for getting an abortion, like some women do because of the law restrictions in several states. In short, Trump can make the lives of a lot of people a lot more unpleasant than they are right now. The problem with acting only “when it’s an emergency” is that there will be no siren going off telling you that the people controlling the country are off committing dastardly deeds against everything you stand for. Remember how far Hitler got before it started occurring to people that mayyybe he wasn’t doing the right thing? I’m not saying Trump is Hitler, not at all, but I’m saying it’s hard to notice you’re taken away by the tide when you’re in the middle of it. Natalie made the right choice. She’s in a position of influence because of her celebrity status and now she’s using that influence to do some good. Fornicator bill Clinton and his complice Hilary !